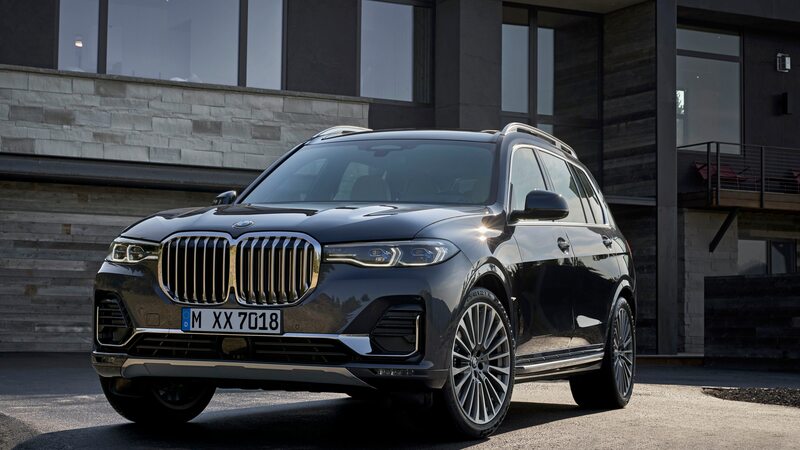 BMW offers a pretty wide range of utility vehicles, from big to small, V-8s to plug-in hybrids, and even crossover coupes. 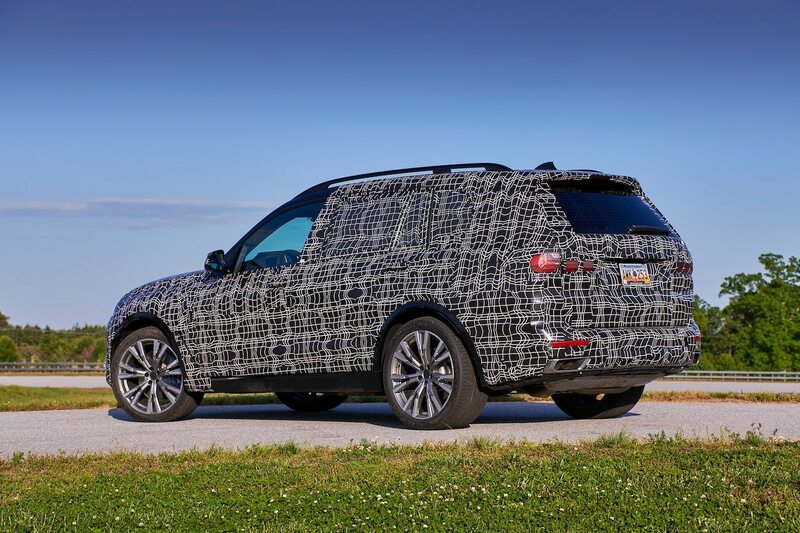 But there remains one major hole in the lineup: a full-size SUV. 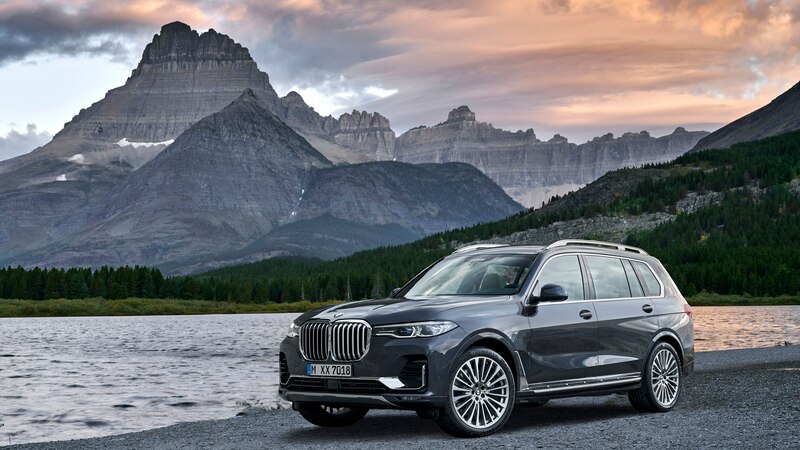 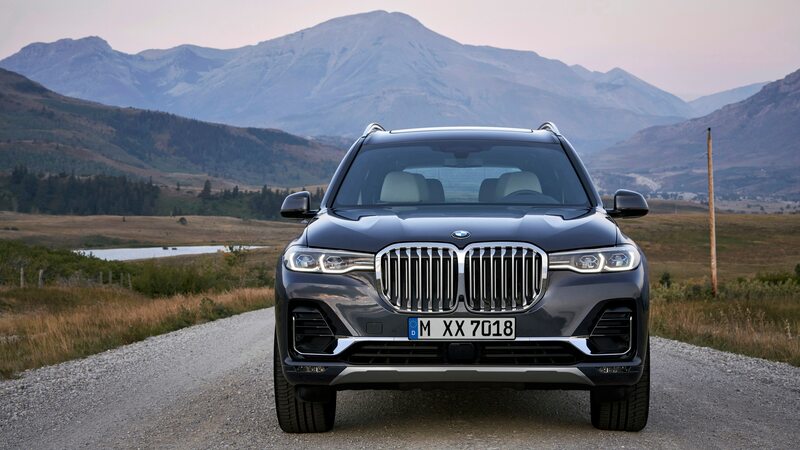 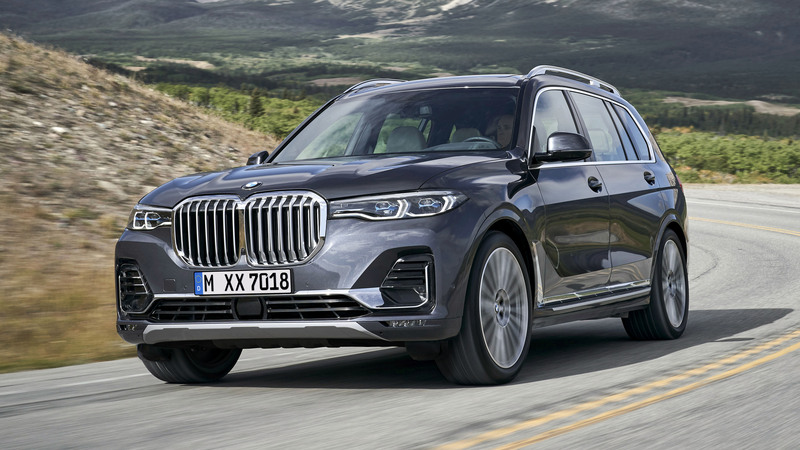 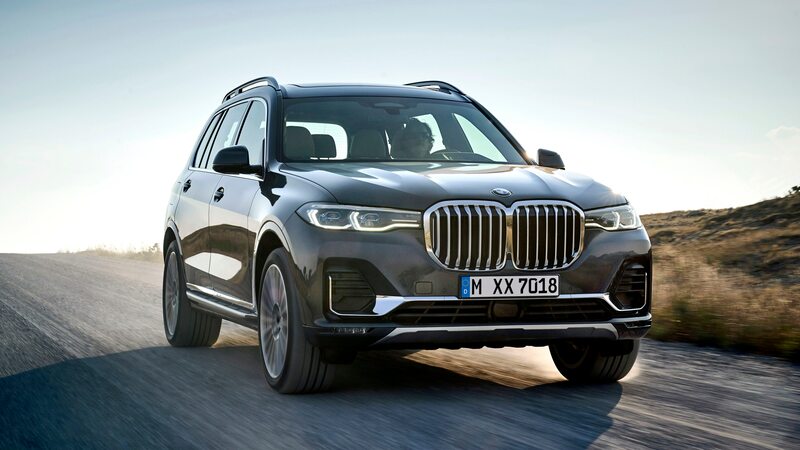 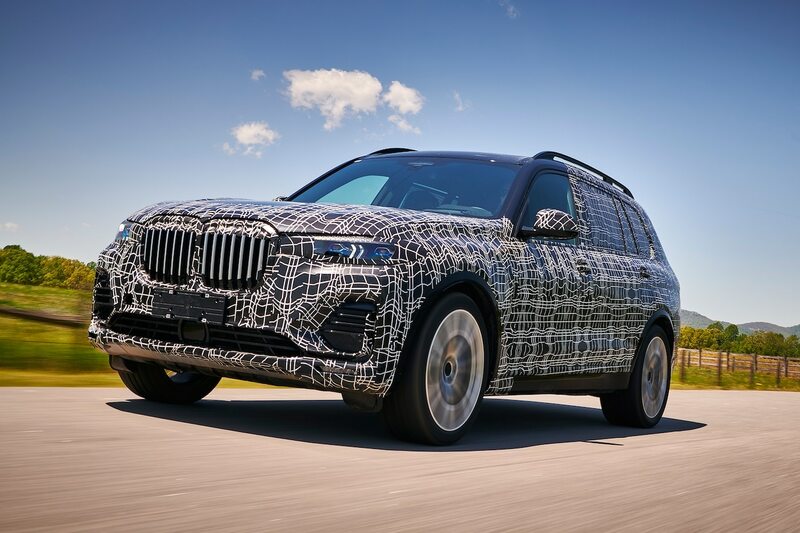 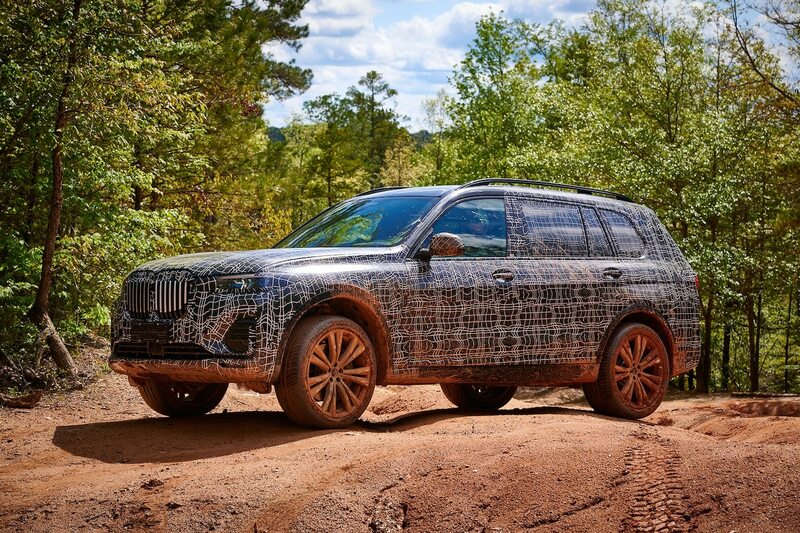 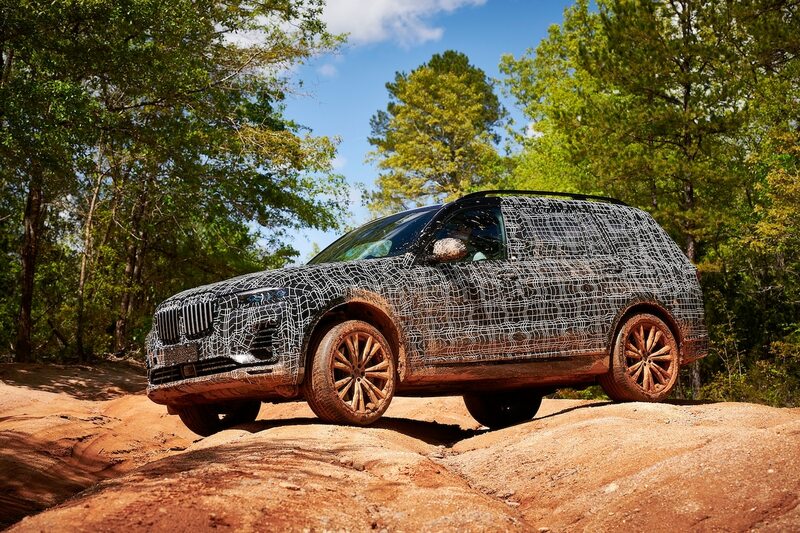 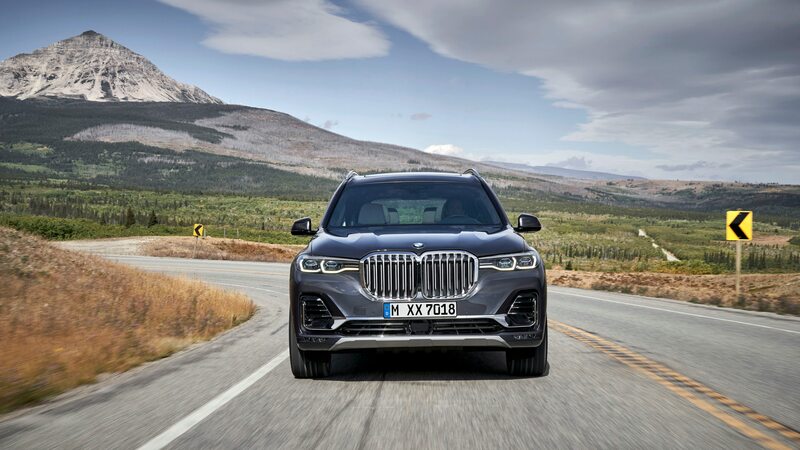 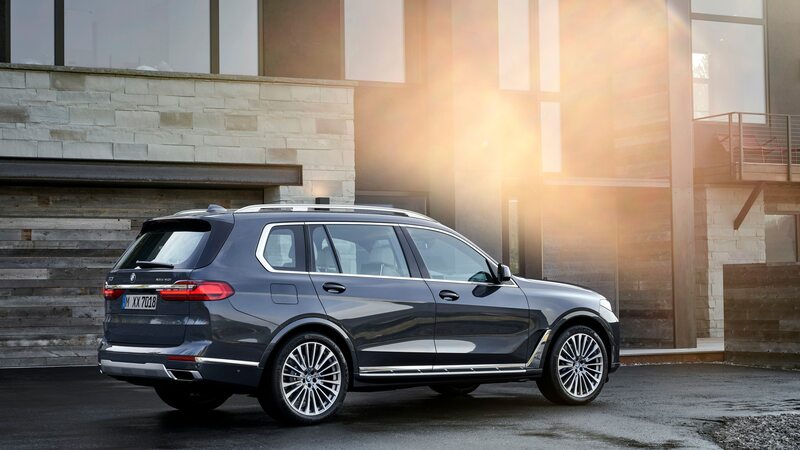 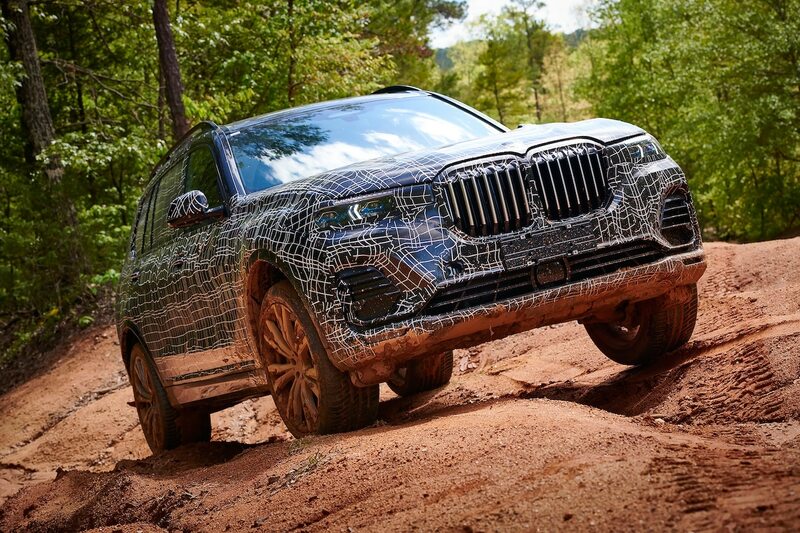 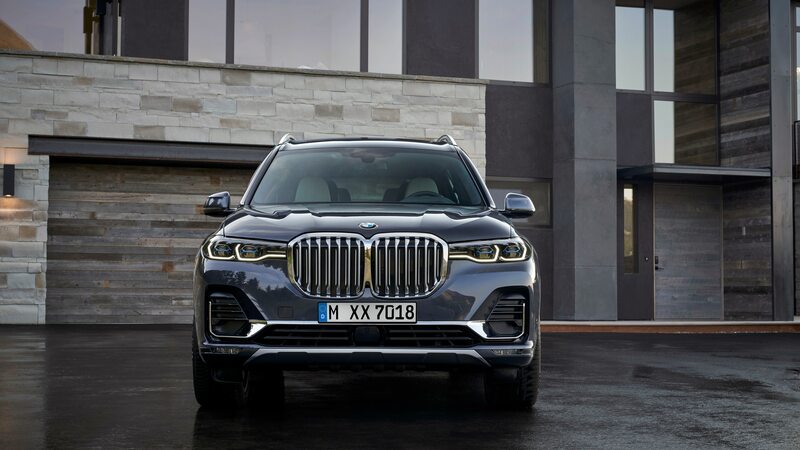 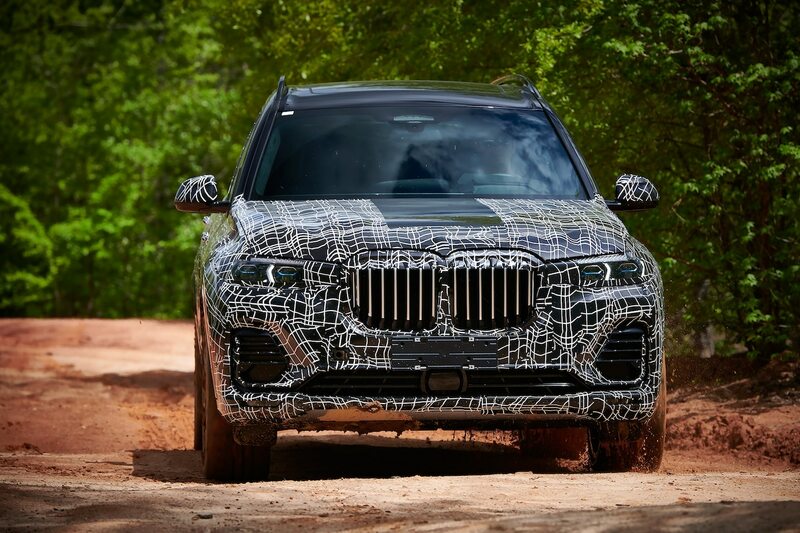 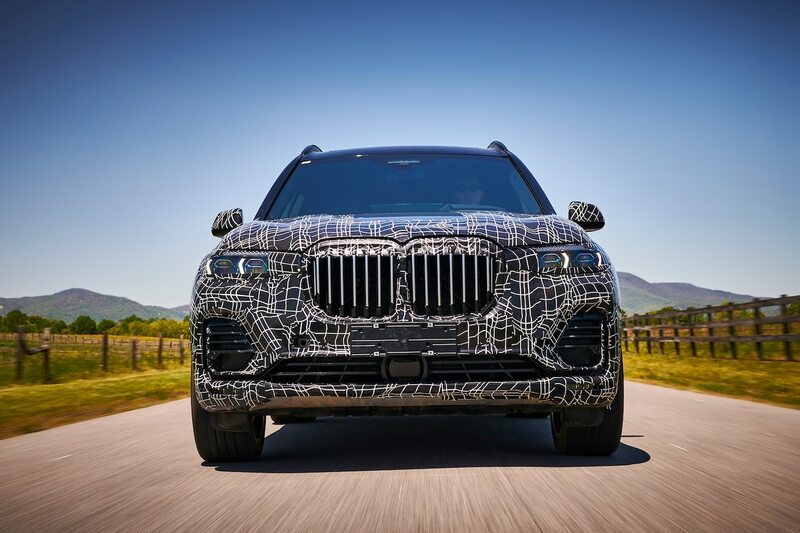 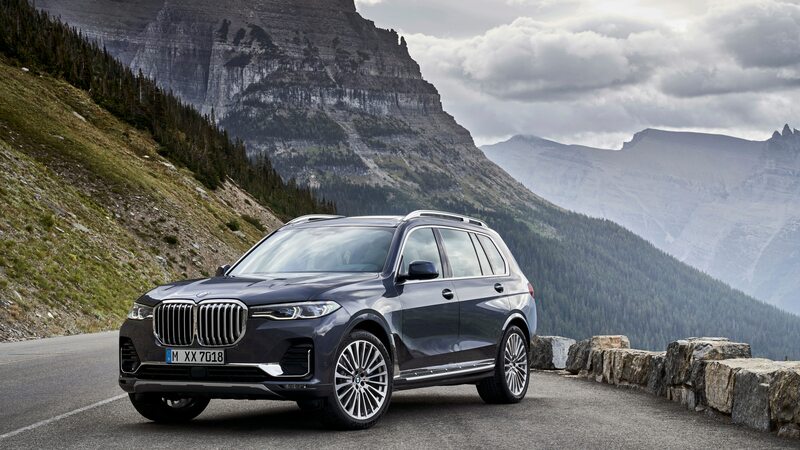 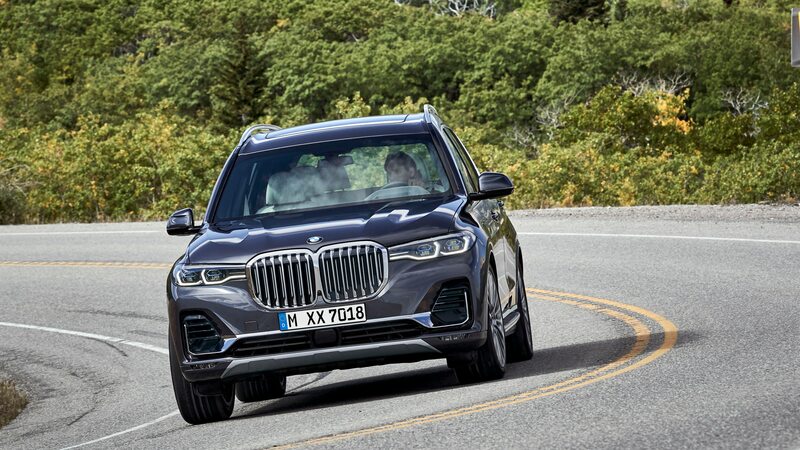 The 2019 BMW X7 will make a belated entrance into this highly lucrative segment when it goes on sale in the U.S. in March 2019. 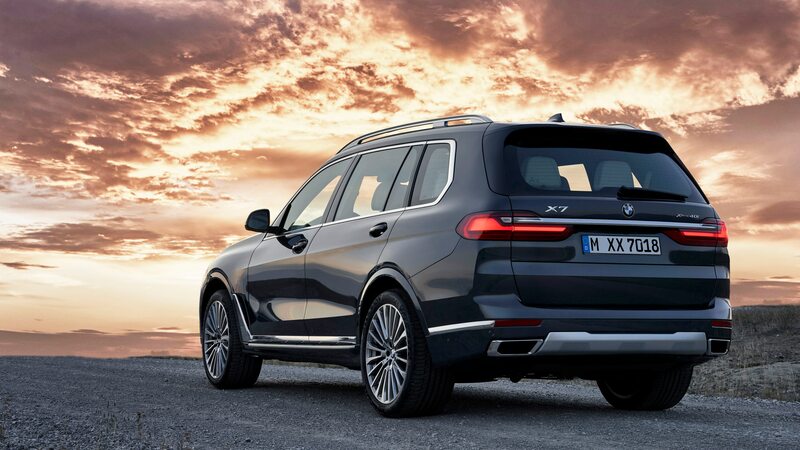 At this time, it will compete against established players including the Audi Q7, Mercedes-Benz GLS, Lexus LX, and Infiniti QX80. 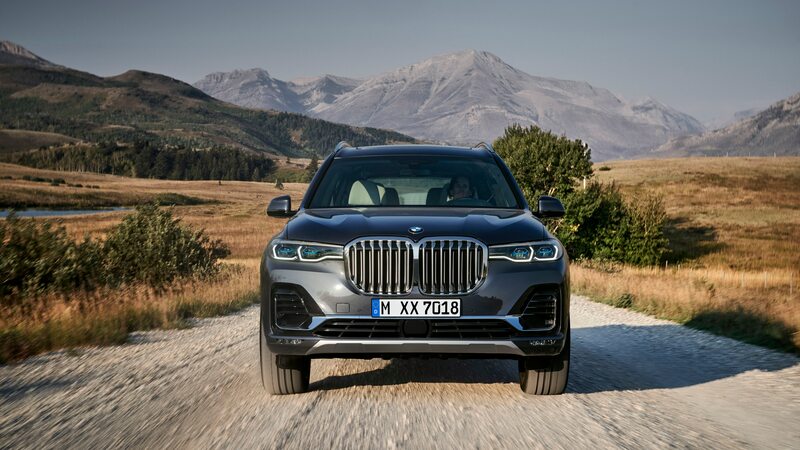 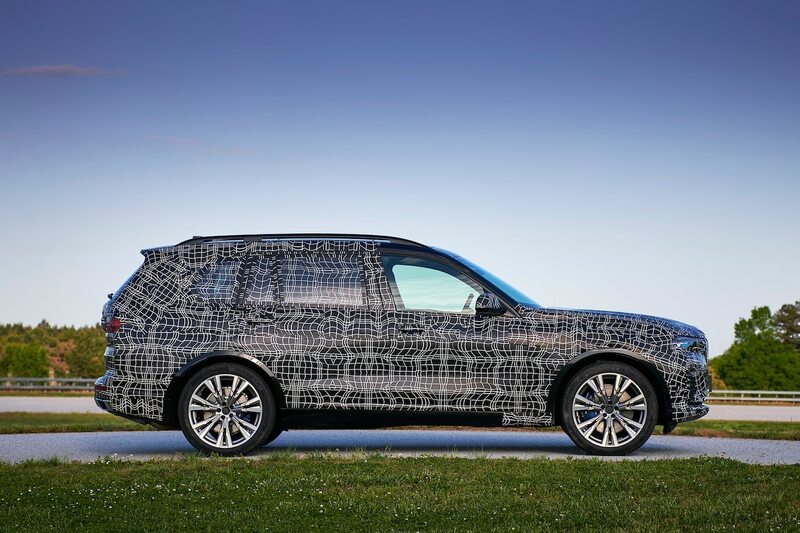 BMW is making up for lost time with a design that signals the X7’s position at the top of the lineup. 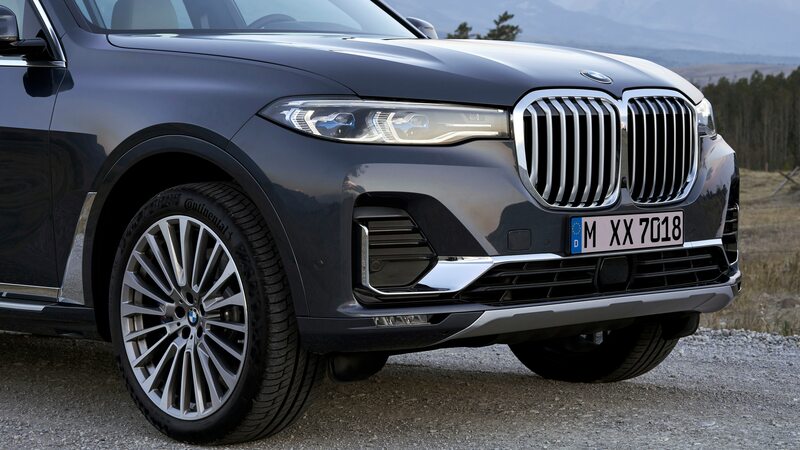 The model features the largest kidney grille ever for a BMW. 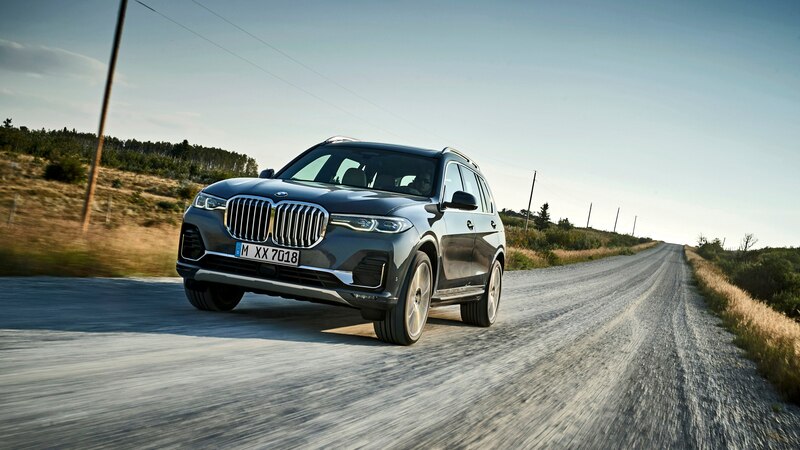 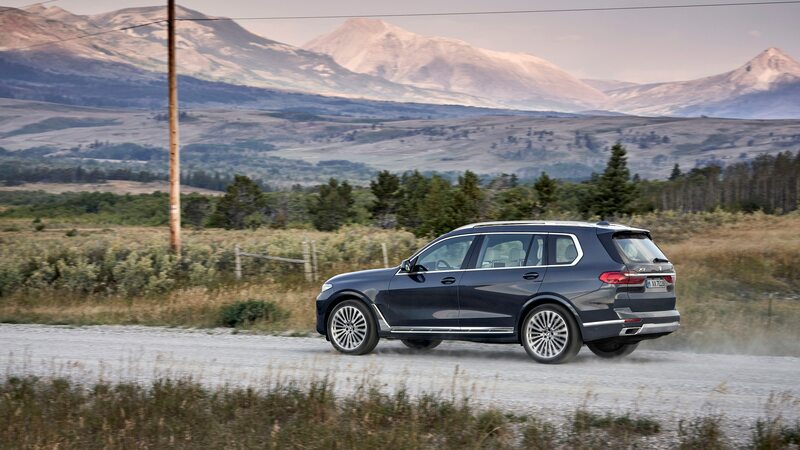 Measuring 9 inches longer than the X5, the size of this SUV also makes an impact. 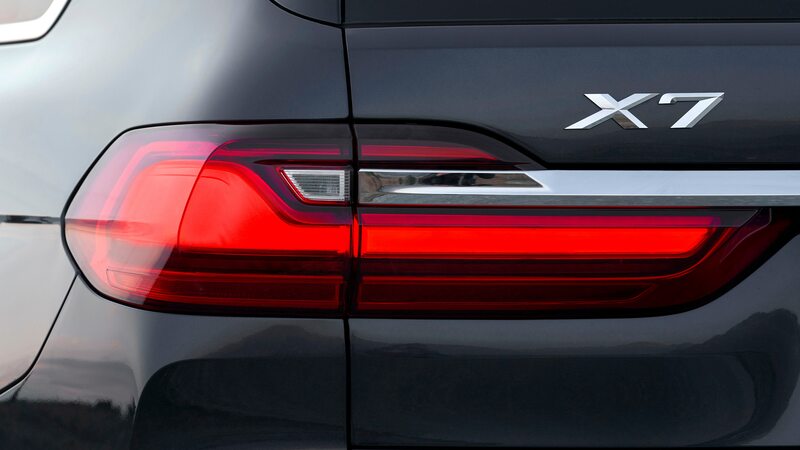 Bright accents adorn the exterior, including a chrome bar that connects the taillights, a detail shared with the 7 Series. 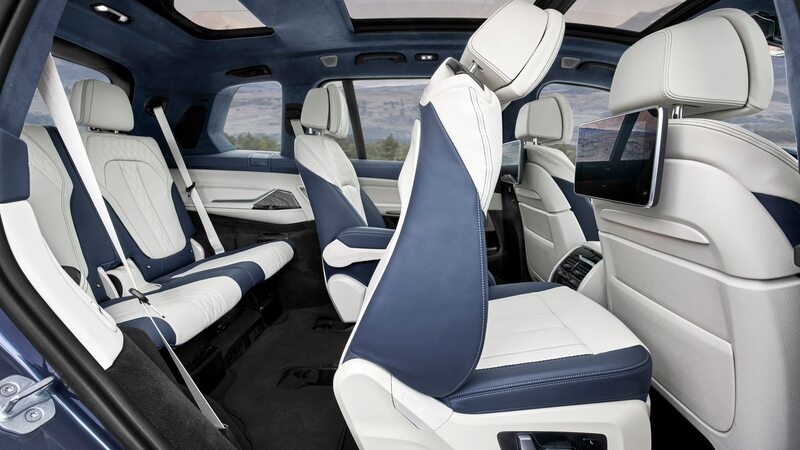 The X7 seats seven passengers in standard configuration, or six when equipped with captain’s chairs. 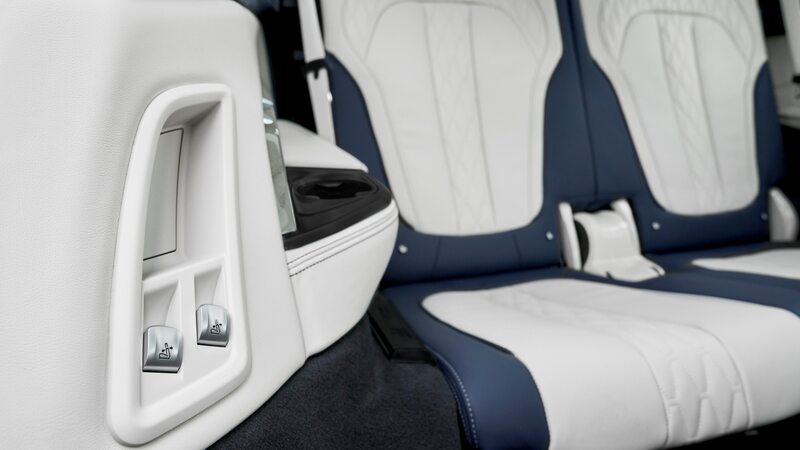 Vinyl seats are standard, but buyers can opt for leather seats in a host of different colors. 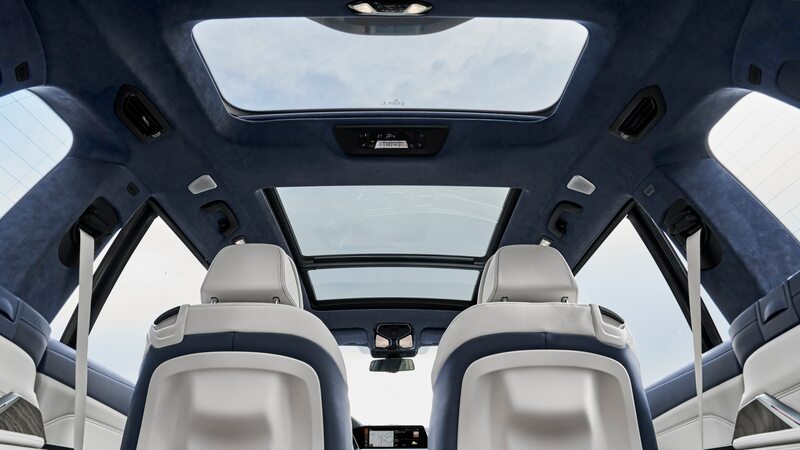 Third-row passengers aren’t assigned to a penalty box; instead, they receive cupholders, armrests, their own sunroof, and controls for the rear sliding shade. 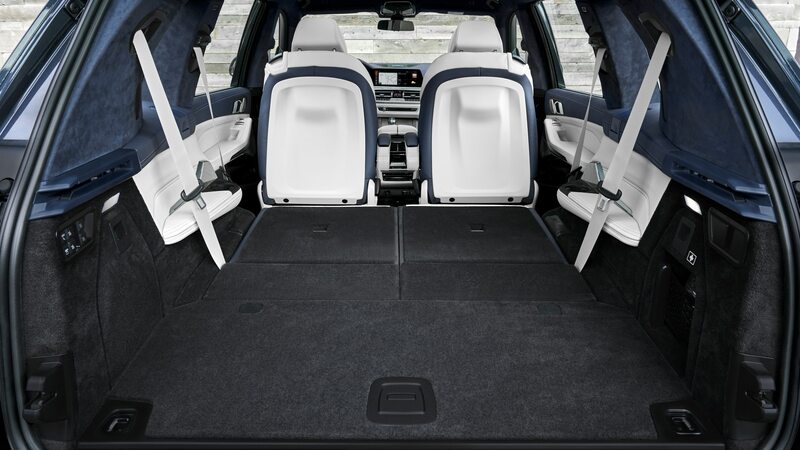 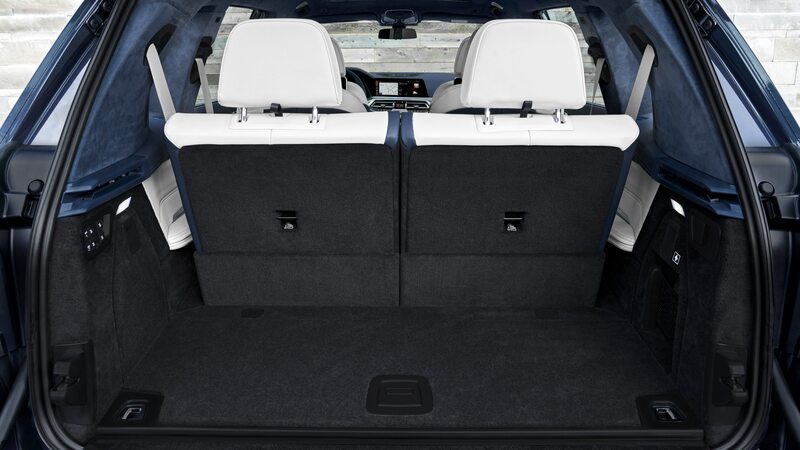 There are buttons on the rear doors and in the cargo area to fold up or raise the backrests of the second- and third-row seats. 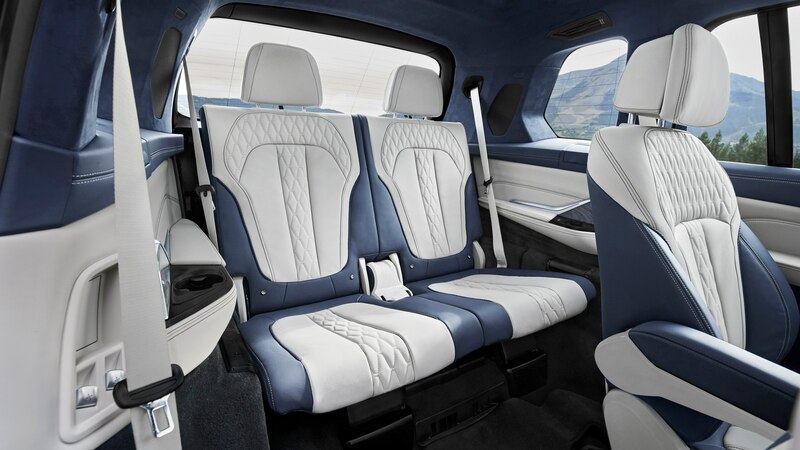 The second-row seats can be tilted to make it easier to access the third row. 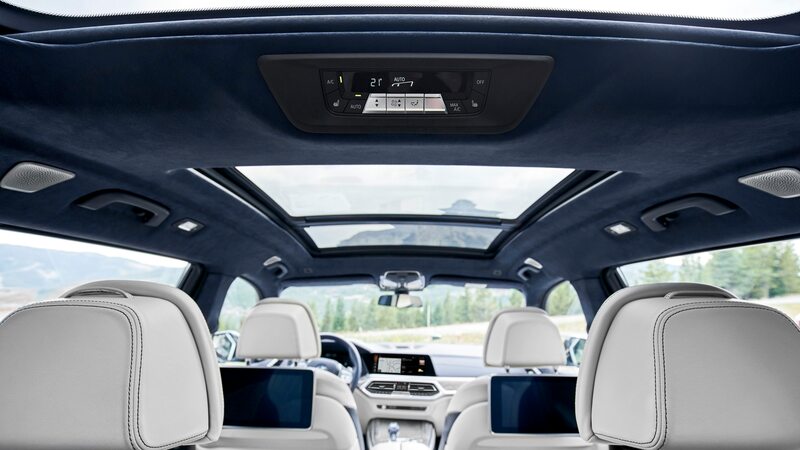 A solid list of standard features includes four-zone climate control, a 10-speaker audio system, wireless charging, and a Wi-Fi hotpot. 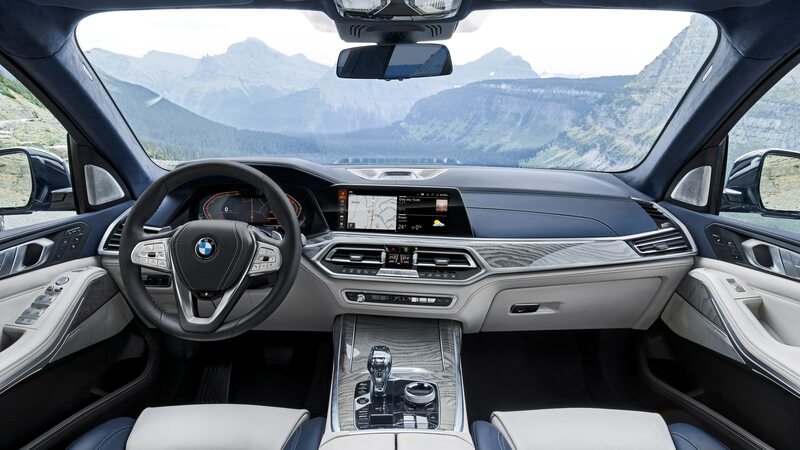 Taking aim at Audi’s virtual cockpit, the model gets a new 12.3-inch digital instrument cluster display as well as a 12.3-inch central display. 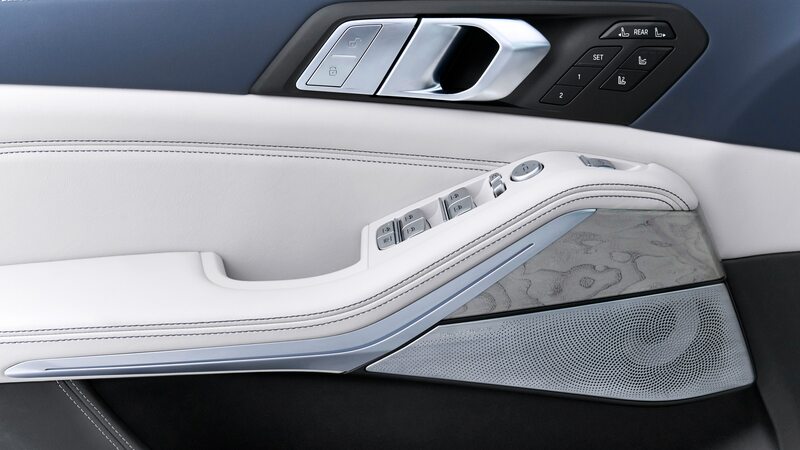 The infotainment controller on the center console now comes with flat haptic controls instead of physical buttons. 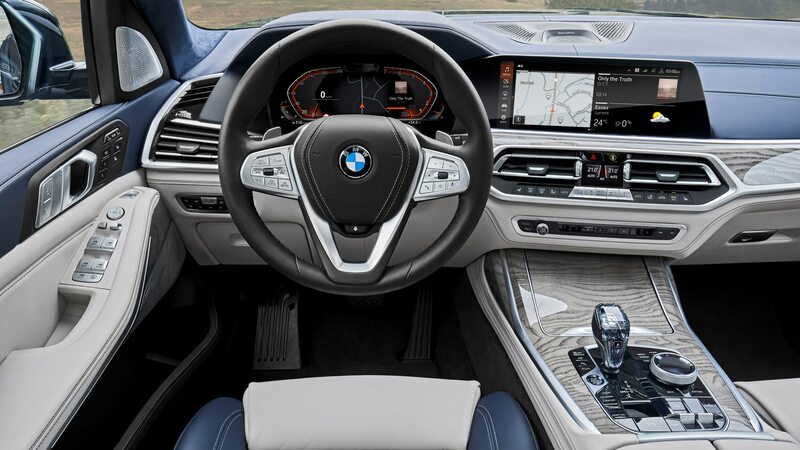 Like the new 3 Series, the model features a personal assistant that can provide navigation directions, adjust the car’s temperature, find parking spaces, and answer other questions through voice commands that start with “Hey, BMW.” Options include a head-up display, soft-close automatic doors, panoramic sky lounge LED roof, heated and cooled cupholders, and a rear entertainment package with a pair of 10.2-inch touchscreen displays and DVD player. 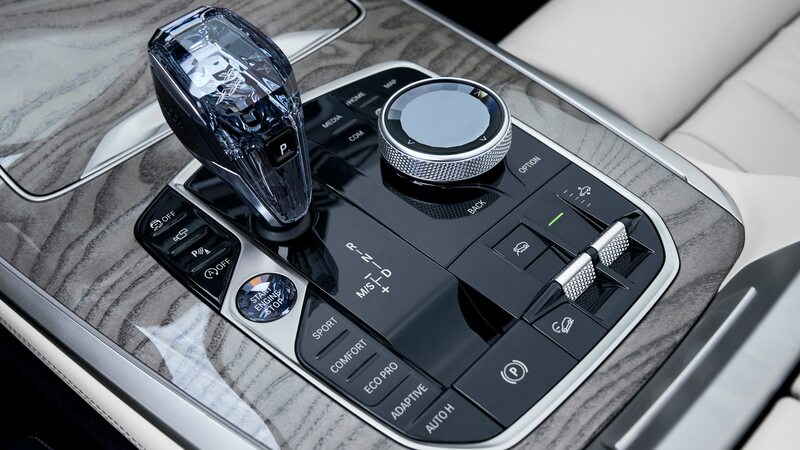 To up the ante even further, there are optional glass controls for the gear shift lever, stop/start button, infotainment system controller, and volume knob. 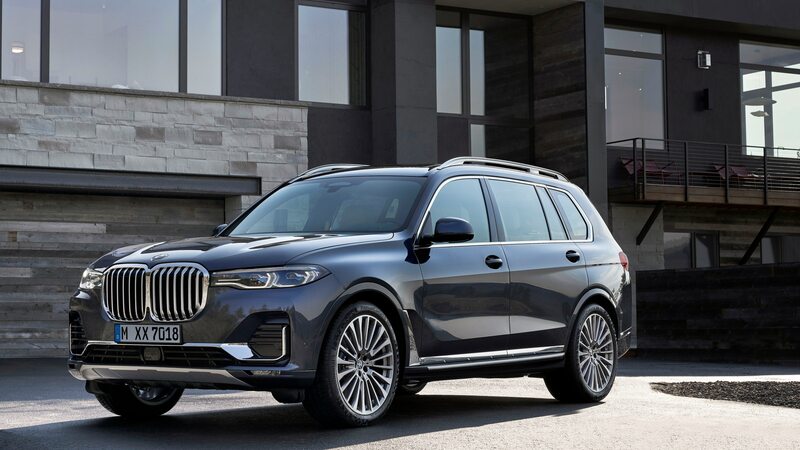 Keeping things simple, BMW is offering two trims: the xDrive40i and xDrive50i. 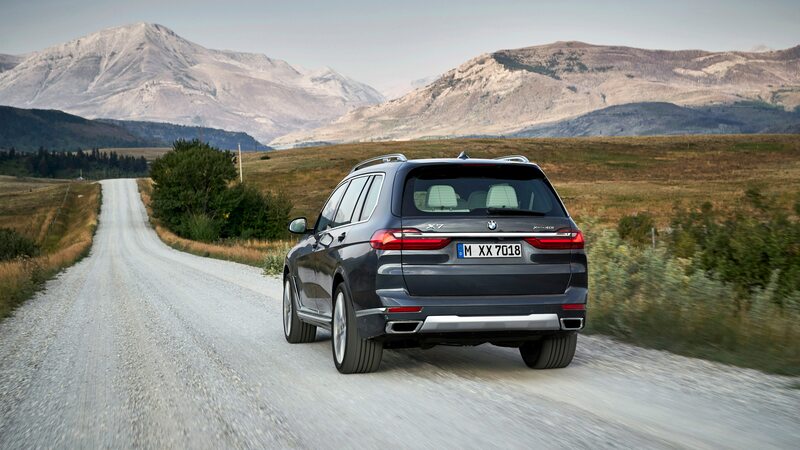 Engine choices mirror those on the X5. 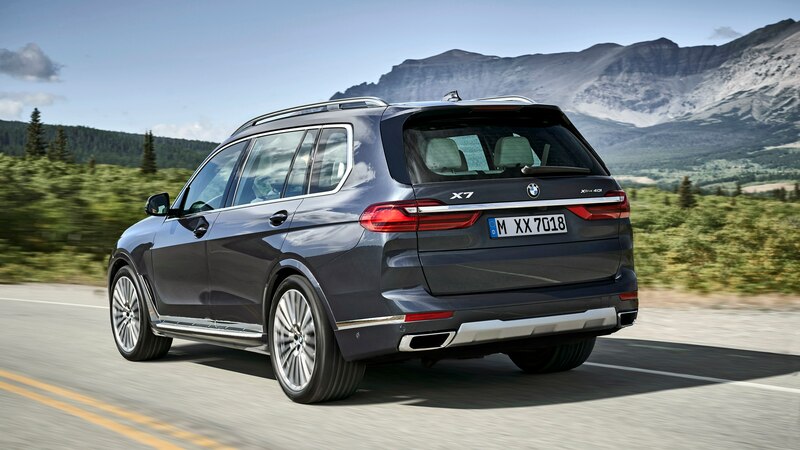 The 40i comes with a 3.0-liter inline six-cylinder engine with a single twin-scroll turbocharger. 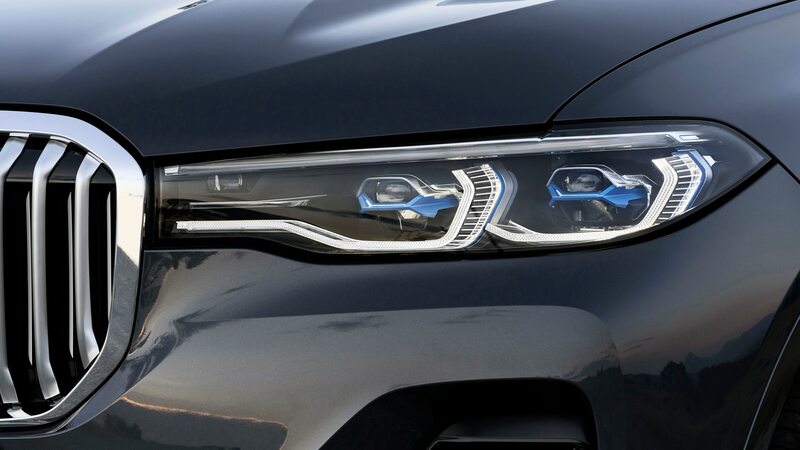 It makes 335 hp and 330 lb-ft of torque, which BMW says is enough to run from 0 to 60 mph in 5.8 seconds. 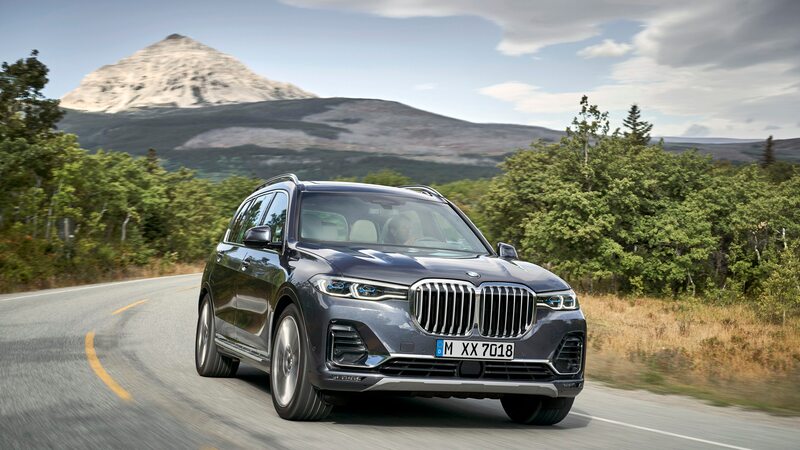 The 50i upgrades to a 4.4-liter twin-turbo V-8 good for 456 hp and 479 lb-ft. With this engine, the big Bimmer can hit 60 mph in a claimed 5.2 seconds. 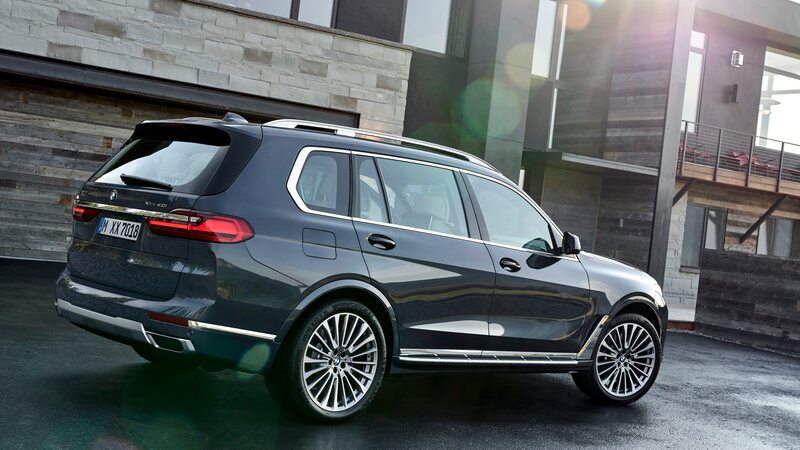 Not bad considering the V-8 model weighs more than 5,600 pounds. 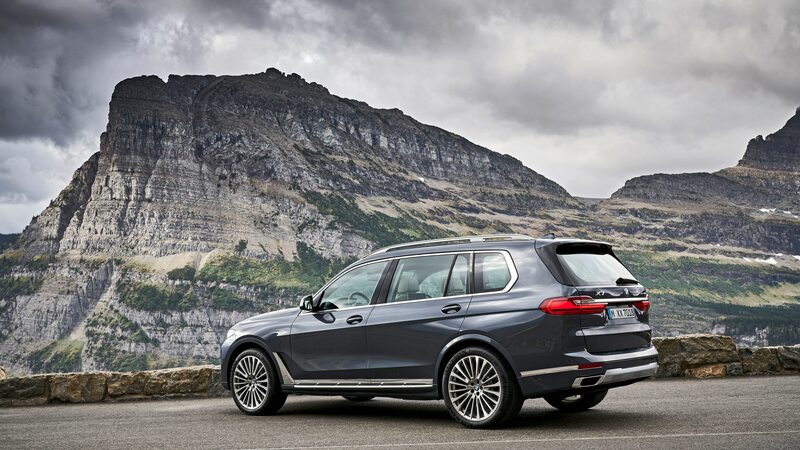 Both engines receive an eight-speed automatic transmission retuned for improved efficiency and shift comfort. 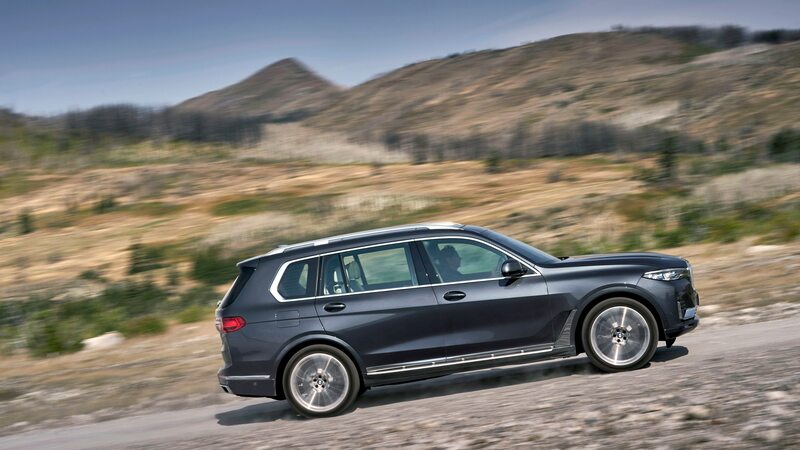 The top speed on both models is 130 mph, and as the trim names suggest, they come standard with all-wheel drive. 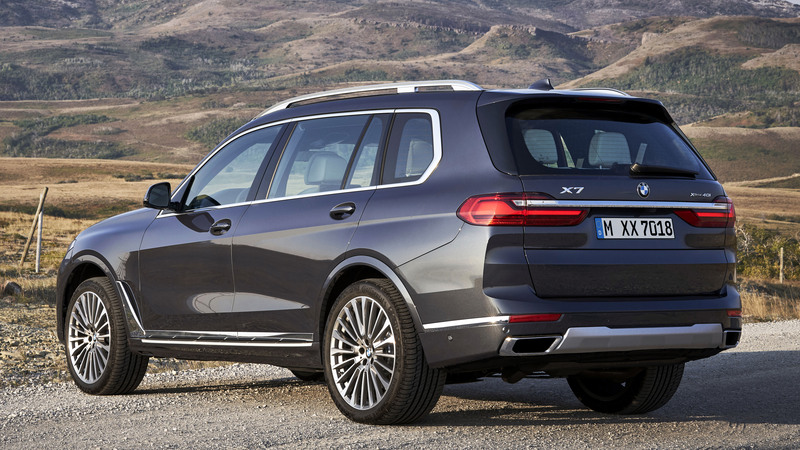 The X7 sits on the new CLAR flexible architecture that underpins a host of other BMW cars and SUVs. 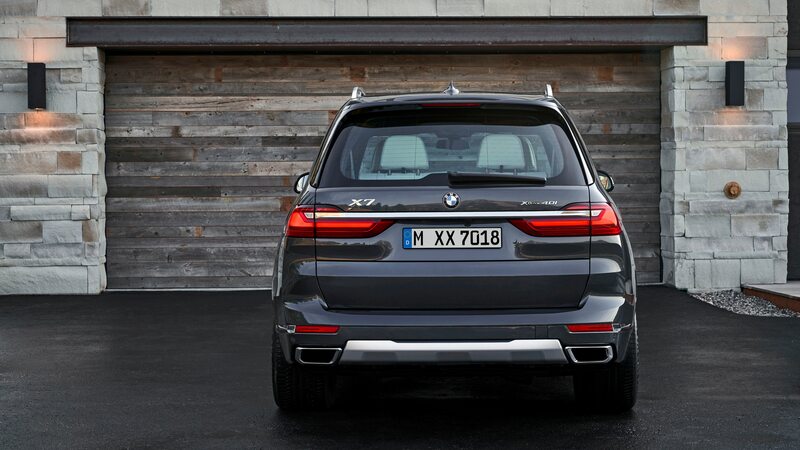 All X7s receive a two-axle air suspension that automatically adjusts its height based on road conditions. 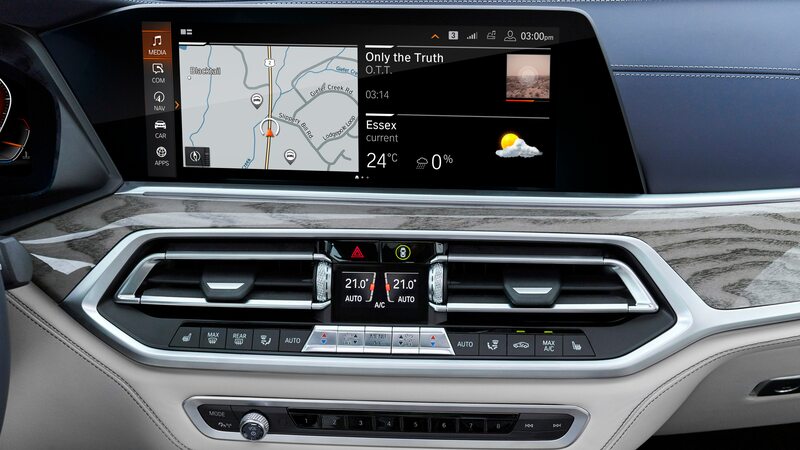 Drivers can also adjust the position manually with the push of a button, up to 1.6 inches above the standard setting. 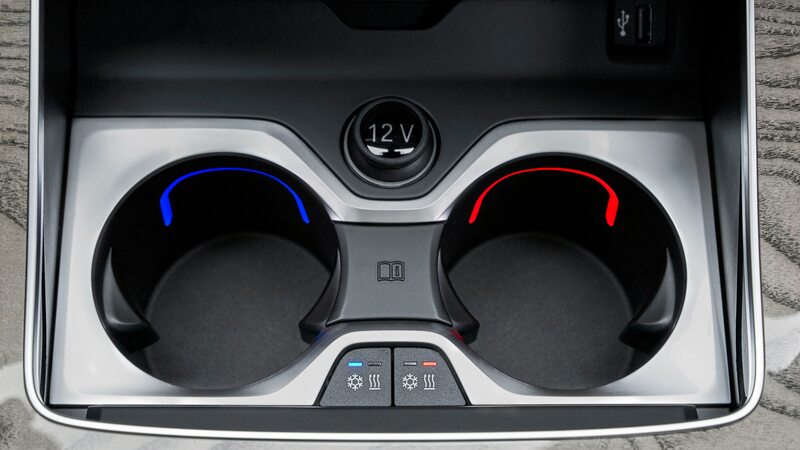 There is both a comfort and a sport setting, and each should feel appropriately different. 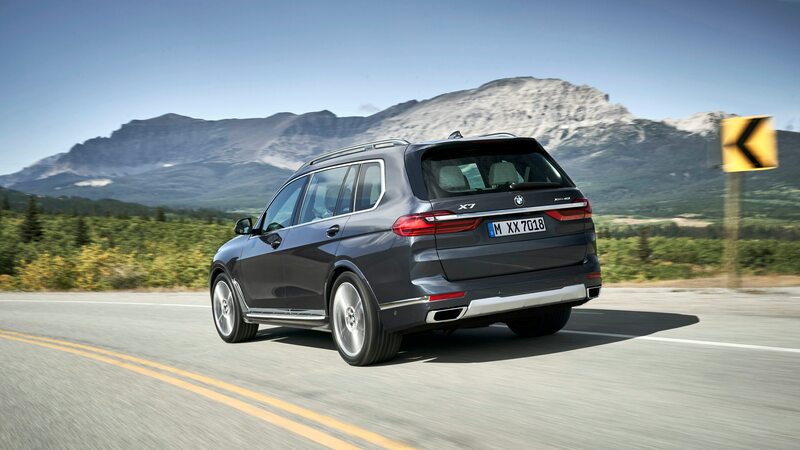 A Dynamic Handling package is available with M Sport brakes, integral active steering, and on 50i models, the M Sport rear differential. 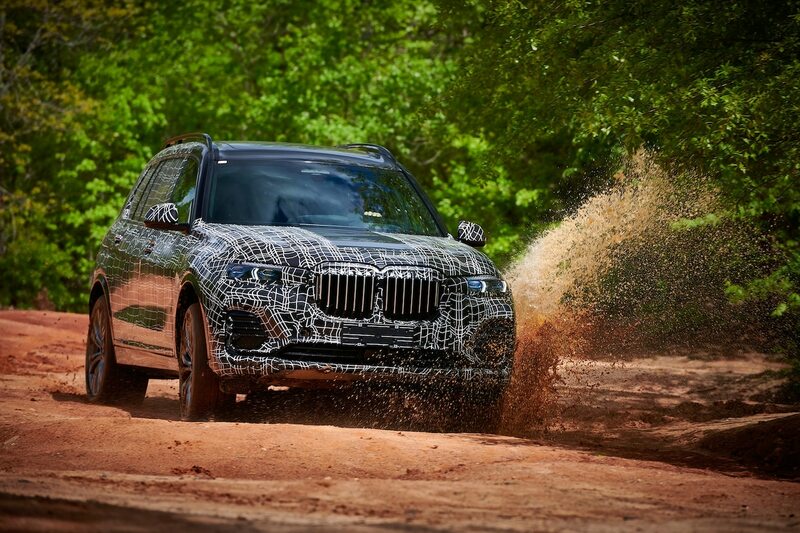 Customers can pre-order the X7 online, a first for BMW. 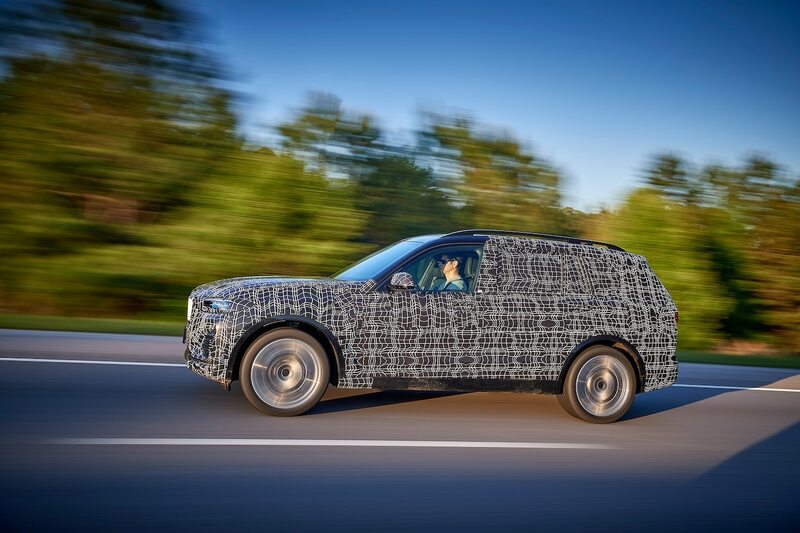 Pre-ordering begins this month, and those who go through the process will receive priority vehicle production. 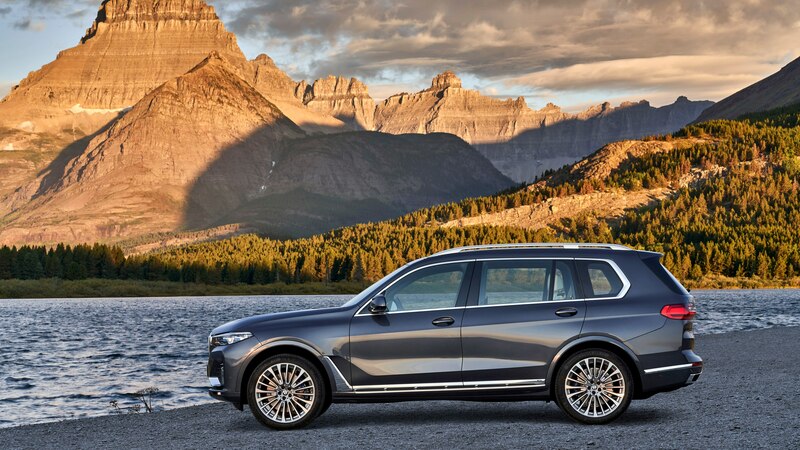 Prices begin at $74,895 for the 40i and $93,595 for the 50i.